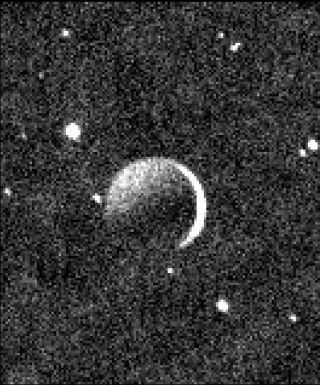 This image by NASA’s New Horizons spacecraft shows the night side of Pluto’s biggest moon, Charon, against a star field, lit by faint reflected light from Pluto itself. The bright crescent on Charon's right side is a sliver of sunlit terrain; it is overexposed. New Horizons was about 100,000 miles (160,000 kilometers) beyond Pluto when it took the image on July 15, 2015. NASA's New Horizons spacecraft keeps showing us things we've never seen before. The probe's latest jaw-dropping photo is simultaneously familiar and exotic: Pluto's largest moon, Charon, in crescent phase. Sunlight shines on a sliver of Charon, while the bulk of the moon's night side is lit faintly by reflected "Plutoshine," NASA officials said. Also on Thursday, NASA released a global color map of Pluto made using three images captured by the Ralph camera during New Horizons' flyby. "The mosaic shows how Pluto's large-scale color patterns extend beyond the hemisphere facing New Horizons at closest approach, which were imaged at the highest resolution," NASA officials wrote in an image description Thursday. This new, detailed global color map of Pluto is based on a series of three color filter images obtained by the Ralph/Multispectral Visual Imaging Camera aboard New Horizons during the NASA spacecraft’s close flyby of Pluto in July 2015. Though the Pluto flyby occurred 18 months ago, New Horizons' work is far from done. The spacecraft is currently zooming toward a Jan. 1, 2019, close encounter with another frigid, distant body: a small object known as 2014 MU69, which lies about 1 billion miles (1.6 billion km) beyond Pluto's orbit. At the moment, New Horizons is about 3.6 billion miles (5.8 billion km) from Earth, and about 410 million miles (660 million km) beyond Pluto, according to the mission's position tracker.